6/5/2008 - Arnold Air Force Base, Tenn. -- "Leadership is a potent combination of strategy and character. But if you must be without one, be without the strategy." - Army General H. Norman Schwarzkopf, commander of the Coalition Forces in the Gulf War. Sitting among approximately 4,000 people at Fort Hood, Texas, I received a life lesson about character. The weekend prior to Memorial Day weekend, I had the opportunity to attend a memorial service at Fort Hood with my family memorializing all of their fallen soldiers. My cousin, Sgt. 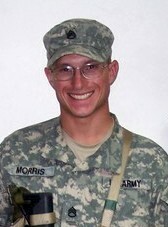 Daniel Morris, was among the fallen. 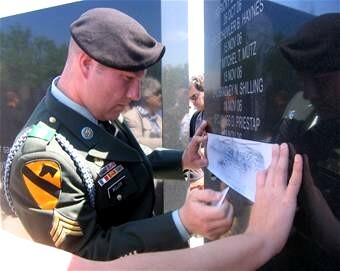 A memorial wall was updated with the soldiers' names and rededicated May 16. During the ceremony, the guest speaker, former commanding general of the 1st Calvary Division, Lt. Gen. Joseph F. Fil, Jr., spoke of Army Spc. Ross McGinnis. Specialist McGinnis, who was posthumously promoted to specialist, was part of a six-vehicle patrol in Baghdad on Dec. 4, 2006, when an insurgent threw a grenade into his humvee. The grenade was lodged between two radios inside the humvee. Specialist McGinnis, who realized the other four soldiers in the humvee did not know where the grenade had landed and did not have time to escape, threw his back against the radio mount and smothered the grenade with his body. For his actions that day, Specialist McGinnis was awarded, among other awards, the Medal of Honor, Bronze Star and Purple Heart. As this story was told, I sat in my seat and thought about what great bravery and character he had and how I'm not sure I could have done what he did. I received another life lesson about character later that afternoon, but it was more personal this time. My family and I had the opportunity to meet two of the soldiers who were in the vehicle my cousin was in the day he died: Sgt. Eric Nunn and Spc. Brad Griffith. Specialist Griffith was driving and Sergeant Nunn was the gunner when their humvee hit an improvised explosive device. Without giving it a second thought, Specialist Griffith pulled Sergeant Nunn, who suffered injuries on his right side, out of the gunner's hatch. After pulling Sergeant Nunn out of the humvee, Specialist Griffith returned to the humvee and pulled out another soldier, Specialist Eugene DeNeutte out of the smoking humvee and helped him to safety. Specialist Griffith then manned the machine gun in search of the IED triggerman. Each time I think of this incident which took my cousin's life, I wonder if I were in the same situation, could I have or would I have done the same thing? Sadly, I don't know that I could have. The fact that Specialist Griffith helped two injured soldiers to safety speaks volumes about his character. Both Sergeant Nunn and Specialist Griffith spoke about what a wonderful person Daniel was. They spoke of how he always invited people to church and what a good noncommissioned officer he had been. My family and I spent the rest of the afternoon of the memorial service with Sergeants Nunn, Miller, Crocker and Mathis, who were our escorts. I spent a majority of my time talking with Sergeant Nunn that afternoon as he drove part of my family around Fort Hood. I learned that day that not only is he an Army Sergeant, but he's a father. He came across as somewhat quiet, but very friendly and easy to talk with. Character, as defined by the American Heritage Dictionary, is, "The combination of qualities or features that distinguishes a person, group or thing from another." Specialist Griffith, Sergeants Nunn, Miller, Crocker and Mathis and all of the other military personnel my family met at Fort Hood are amazing soldiers. There are no words that can truly describe their character. If you had the choice between saving yourself or smothering a grenade with your body to save your fellow soldiers, would you? If you had the choice to make sure you were safe or to go pull two injured soldiers out of a vehicle, knowing at anytime a second IED could go off, what choice would you make? It has been said that, "your true character is revealed by the clarity of your convictions, the choices you make, and the promises you keep. Hold strongly to your principles and refuse to follow the current of convenience. What you say and do defines who you are, and who you are...you are forever." The soldiers I met at Fort Hood exemplify and represent what is right about America. All have volunteered to serve our nation in a tough job, and they serve with professionalism, patriotism and most of all "with character."